ROLOK Products is capable of building off any cut sheet, line drawing, or sketch that you provide. We also have created an easy to use Letter System Order Sheet as a way to guarantee that you recieve the products you want. The first step in a successful duct order is pre-planning for the job. Careful attention to this step can enhance profitability on a project. The following steps taken during the detailing and ordering of the job can save your field personnel many hours of wasted field labor. Provide piece numbers for each piece of the system if this is appropriate. This information will be printed on the labels that ROLOK applies to each piece of duct. Specify different label colors for the different systems or sections of the job. This allows you to sort the material by color when it arrives on the job greatly speeding up receiving and making it faster to distribute the material within the building. Order material by floor, wing or other reasonable portion. This will prevent overloading the job with excessive amounts of material. This reduces sorting time and eliminates the need to move material multiple times as the job progresses. ROLOK Products’ “just in time ”deliveries will ensure that material is available for your field crews as the job progresses. Ordering jobs in this fashion will not add to the cost of the job if the material is ordered in full truckloads. Consider using a single gauge standard for all spiral duct on the job. For a minimal increase in price, this allows your field personnel to use any piece of spiral anywhere in the system. This eliminates time-consuming sorting by gauge and eliminates the even more costly chance of installing material inappropriate for the application. 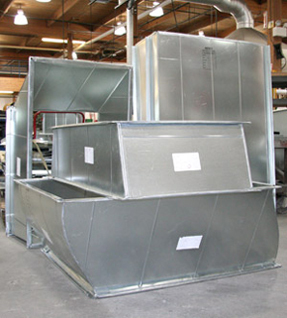 Order full-length pieces of straight duct. Ordering your rectangular duct in 59" lengths for S & D and 56" lengths for TDC duct will cost the same or less than shorter lengths. This applies to both sound attenuated and uninsulated duct.